Brazilian Formula One driver Emerson Fittipaldi, was born December 12th 1946, and throughout a long and successful career he has won the Indianapolis 500 twice and championships in both Formula One and CART.Aged 14 Fittipaldi was racing motorcycles, and aged 16 hydrofoils. While racing one day, his brother Wilson took off at 70 mph (110 km/h) and landed upside down – they both decided that although he had survived, they would no longer race hydrofoils and moved onto to racing karts.The pair moved to racing Formula Vees, and built up a company with their parents. In his second season in single-seaters, Fittipaldi won the Brazilian Formula Vee title at 21 years old. He left for Europe in 1969, with the ambition to convince team owners of his talent in three months. After some podiums and his first victories in Formula Ford, Fittipaldi was first trained and then subsequently engaged by the Jim Russell Driving School Formula Three team.Fittipaldi continued to win, drawing the attention of Colin Chapman, who was looking for a driver to support the Austrian Jochen Rindt in the 1970 Formula One season. The team’s No 3 driver, he ended up becoming No 1 driver after Rindt was killed at Monza and John Miles left the team. Thrust into the spotlight by leading F1′s top team, he proved up to the task and won for Lotus in its first race post-Rindt.In his first full year as Lotus’ lead driver in 1971, Fittipaldi finished sixth in the drivers’ championship as the team further developed the previous season’s Lotus 72. Armed with what was arguably the greatest Formula one design of all time, the Lotus 72D, Fittipaldi proved dominant in 1972 as he won five of 11 races and easily won the F1 Drivers’ Championship from Jackie Stewart by 16 points. At 25 he was then the youngest champion in F1 history.Fittipaldi left Lotus to sign with the promising McLaren team. Driving the highly efficient McLaren M23, he had three victories in 1974, reached the podium four other times, and beat out Clay Regazzoni in a close battle for his second championship. The following season, he notched two more victories and four other podiums, but was second to a dominant Niki Lauda. However, at the height of his F1 success, Fittipaldi shocked everyone by leaving McLaren to race for older brother Wilson Fittipaldi’s Copersucar-sponsored Fittipaldi Automotive team. Emerson Fittipaldi decided to retire from Formula One racing at the end of 1980 & took time out from major racing for four years, returning in 1984 in CART. The 38-year old spent his first season acclimatising to IndyCars, driving for two teams before joining Patrick Racing as an injury replacement. He stayed five years with the team, recording six victories and solid finishes in the overall standings. In 1989 he had five wins and finished in the top five in every race he completed, giving him a CART championship. Among his wins was a dominant performance in the Indianapolis 500 where he led 158 of 200 laps and won by two laps, but only after a dramatic duel with Al Unser, Jr. in the closing laps of the race. Roger Penske hired Emmo for his racing team in 1990 and he continued to be among the top drivers in CART, winning a race with Penske for six straight years. In 1993 he added a second Indianapolis 500 victory by taking the lead from defending Formula One World Champion Nigel Mansell on lap 185 and holding it for the remainderof the race. Fittipaldi returned to Indianapolis to drive the Chevrolet Corvette Pace Car for the 2008 Indianapolis 500. Approaching 50, he was still with Champ Car in 1996 when an injury at the Michigan International Speedway ended his career with 22 wins. In 2003 he made a return to Champcars as a team owner. Fittipaldi was the acting team principal for the Brazilian A1 GP entry.In 2005 Fittipaldi made a surprise return to competitive racing in the Grand Prix Masters event held at Kyalami in South Africa, finishing second behind former CART sparring partner Nigel Mansell and was inducted in the Motorsports Hall of Fame of America in 2001. Despite his success Munch’s self-destructive and erratic behavior continued, and his wife left him after he got involved in an accidental shooting. This deeply upset him and he painted Still Life (The Murderess) and The Death of Marat. In 1903-4, Munch exhibited in Paris where his work inspired the Fauvists, who were famous for their boldly false colors, and When the Fauves held their own exhibit in 1906, Munch was invited and displayed his works with theirs. Munch also received many commissions for portraits and also painted many landscapes, human figures and situations. 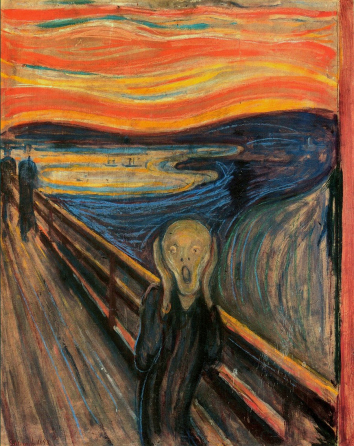 Sadly during 1908, Munch’s anxiety, compounded by excessive drinking and brawling, had become acute. Subject to hallucinations and feelings of persecution, he entered the clinic of Dr. Daniel Jacobson for the next eight months which stabilized his personality, and after returning to Norway in 1909, his work became more colourful and less pessimistic. Museums also began to purchase his paintings and he was made a Knight of the Royal Order of St. Olav “for services in art”. His first American exhibit was in 1912 in New York & produced several full-length portraits of high quality of friends and patrons & also created landscapes and scenes of people at work and play, using a new vibrant colourful optimistic style. Munch spent his last two decades at his nearly self-sufficient estate in Ekely, at Skøyen, Oslo, painting farm life and unsparing self-portraits, detailing his emotional and physical states. American singer and film actor Frank Sinatra was born December 12, 1915.He began his musical career in the swing era with Harry James and Tommy Dorsey, Sinatra found unprecedented success as a solo artist from the early to mid-1940s after being signed to Columbia Records in 1943. Being the idol of the “bobby soxers”, he released his first album, The Voice of Frank Sinatra in 1946. His professional career had stalled by the 1950s, but it was reborn in 1953 after he won the Academy Award for Best Supporting Actor for his performance in From Here to Eternity.He signed with Capitol Records in 1953 and released several critically lauded albums (such as In the Wee Small Hours, Songs for Swingin’ Lovers, Come Fly with Me, Only the Lonely and Nice ‘n’ Easy). Sinatra left Capitol to found his own record label, Reprise Records in 1961 (finding success with albums such as Ring-a-Ding-Ding!, Sinatra at the Sands and Francis Albert Sinatra & Antonio Carlos Jobim), toured internationally, was a founding member of the Rat Pack and fraternized with celebrities and statesmen, including John F. Kennedy. Sinatra turned 50 in 1965, recorded the retrospective September of My Years, starred in the Emmy-winning television special Frank Sinatra: A Man and His Music, and scored hits with “Strangers in the Night” and “My Way”. With sales of his music dwindling and after appearing in several poorly received films, Sinatra retired for the first time in 1971. Two years later, however, he came out of retirement and in 1973 recorded several albums, scoring a Top 40 hit with “(Theme From) New York, New York” in 1980. Using his Las Vegas shows as a home base, he toured both within the United States and internationally, until a short time before his death in 1998.Sinatra also forged a highly successful career as a film actor, winning the Academy Award for Best Supporting Actor for his performance in From Here to Eternity, a nomination for Best Actor for The Man with the Golden Arm, and critical acclaim for his performance in The Manchurian Candidate. He also starred in such musicals as High Society, Pal Joey, Guys and Dolls and On the Town. Sinatra was honored at the Kennedy Center Honors in 1983 and was awarded the Presidential Medal of Freedom by Ronald Reagan in 1985 and the Congressional Gold Medal in 1997. Sinatra was also the recipient of eleven Grammy Awards, including the Grammy Trustees Award, Grammy Legend Award and the Grammy Lifetime Achievement Award. Sinatra saldy passed away on May 14, 1998, but his music remains popular and his legend lives on.